A knife-wielding man who stabbed a student in a Brooklyn synagogue was shot dead by police after he lunged at officers. Police say they used lethal violence against the suspect after he refused to drop the weapon, AP reports. The incident occurred at the Chabad-Lubavitch Hasidic World Headquarters in Crown Heights at 1:40am on Tuesday. Following the stabbing, a witness flagged down a police officer, who told the unidentified assailant to drop his weapon. The attacker initially dropped his knife, only to pick it up again. Backup from the NYPD's anti-terror squad arrived on the scene, demanding once again he put down his weapon. According to police, he refused and charged at the officer, who discharged his firearm once, striking the attacker in the stomach. A video of the encounter posted online appears to corroborate the police's version of events. The man was taken to an area hospital, where he was pronounced dead. The victim, identified as 22-year-old Israeli rabbinical student Levi Rosenblatt, is reportedly in stable condition. There are conflicting accounts on where his injuries were sustained. Some media outlets say he was stabbed in the neck. Others, however, say he was stabbed in the left temple. Three officers were also taken to the hospital, where they are being treated for ringing in the ear. No motive has been established in the attack, though a spokesman from the synagogue said it was not "terror-related." #Chabad spokesperson claims the #Brooklyn stabbing incident was not premeditated or terror-related. 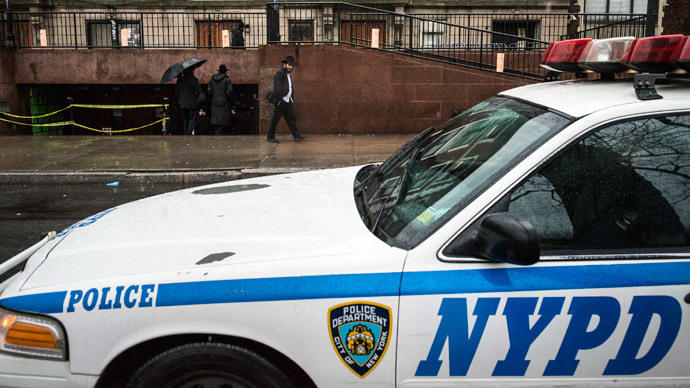 New York Daily News, however, reports the attacker, who they identify as 51-year-old Calvin Peters, was specifically targeting the Jewish community. "I will kill the Jew! I want to kill the Jew! ", the attacker reportedly yelled after entering the center, a witness told the daily. According to the daily, Peters initially scouted out the synagogue and then left an hour before the attack. "He was looking around, He asked for a book," that witness said. "He looked not so much crazy, but different," A 25-year-old Israeli witness said. When Peters returned with a knife in hand, the witness said he had anger in his voice. "I never thought it would happen in New York," the witness told The News. "These things don't need to happen." Chaim Landa, a spokeswoman for, Chabad-Lubavitch commended the "heroic efforts" of all those who took action during the incident. "If not for their intervention the outcome could have been, God forbid far worse,” CBS New York cites Landa as saying. “While we are very pained by everything that has unfolded, we are very grateful to the police for their quick response and are working closely with the authorities in their ongoing investigation."